Life, Laughter and Paris: I Know I Know.....Coffee In Paris Is Ten Dollars!! I Know I Know.....Coffee In Paris Is Ten Dollars!! “It’s so expensive! A friend of a friend says a cup of coffee is $10.00"! (It's rarely someone who has actually been to Paris that's criticizing my favourite city......). And this very expensive coffee.....was it served overlooking the Champs Elysées, the Eiffel Tower or Notre Dame? Did it come in a proper cup? Was it espresso and did the waiter serve it with a little biscuit on the side? Puleeeeeeze (I try not to yank out my hair)! We're talking about sitting at a café in one of the most beautiful cities in the world, not standing in line at a local McDonald’s. (OMG, if you’re in McDonald’s in Paris, I apologize. But really, you should go home). There are plenty of places in Paris where you can eat reasonably, but like every other city, not in the main tourist areas. You can have a 200 Euro dinner at the Jules Verne on top of the Eiffel Tower (you'll never see me there - it's too high in price and well, height), or you can head to a local neighborhood restaurant and have a meal that won't break the bank, and will be absolutely delicious! I loved the look of this Brasserie in Paris and took this photo for future reference. 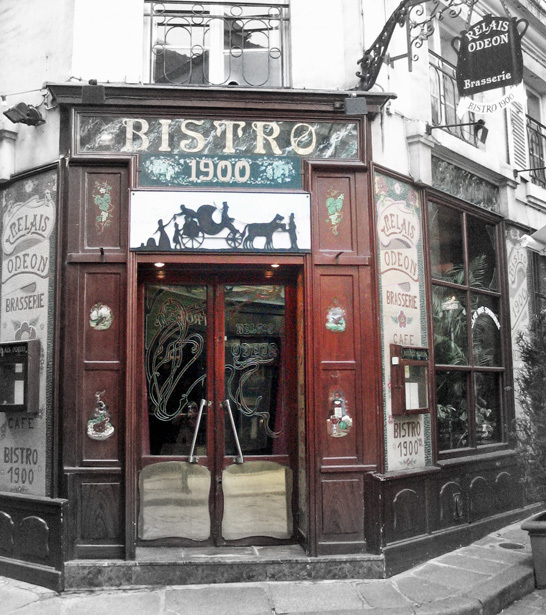 Relais Odéon (Bistro 1900) is in a major tourist area and is very trendy looking inside. I did a bit of comparison work with some Montréal spots. Not to mention the taxes on top of this. I forgot to add them in which means...more expensive than Paris! Neither of these spots are cheap for a burger and fries, but they don't pretend to be bargains. Both offer atmosphere, great food, and are nice places to sit for a few hours. They're in prime locations right in the heart of it all. It's not just food - it's an evening out. Both cities offer cheaper food. I don't HAVE to pay that much for a burger even if I avoid McDonald's. There are plenty of burger places where I can eat for $6.00. But.....not if I want to sit on the banks of the Seine and watch the Eiffel sparkle, or hear the street musicians of Old Montreal on a warm night in July. So please.The next time someone crabs about the $10.00 coffee in France, punch them for me. Well put and a good comparison. It drives me crazy when people complain about the prices in Parisian cafés and bistros, especially when they've been sitting with a view of Nôtre Dame and the menu is in English with pictures. High prices in those places should be expected. Can't say I've ever had a hamburger in Paris but makes for an easier comparison :) Have to say I'd opt for the Camembert sandwich and a glass of wine any time. I would LOVE a $10 coffee in a Parisian cafe overlooking the Eiffel Tower! So would I Kara. I'd have two!